Songwriting helped Calum Scott deal with his fear of coming out, and he hopes to inspire gay people who are afraid to follow his lead. Calum Scott is just weeks away from releasing his debut studio album, 'Only Human'. The 'Britain's Got Talent' contestant is already enjoying major success with his hit single, 'You Are The Reason' - which is currently at number five on the Chamberlains Top 20. Calum's album, which drops March 9, is based on personal experiences, including the challenges he faced coming out as a gay man. Speaking to Pride Source, he says he wants to "move" people with his music. "Since writing an album based on personal experiences, I’ve realized I can inspire people with my music and reach people on an emotional level." The 28-year-old says growing up was difficult for him because of his sexuality. He was afraid to tell people he was gay, but his music helped him learn to express himself. "...when I got into songwriting, the penny dropped for me. I started writing about the fact that I was terrified of coming out to the press. I have a song on the album called 'If Our Love Is Wrong'– it’s right on the top of the album – and it’s all about being terrified of telling people about my sexuality," he told the publication. Calum says he only told his dad about his sexuality three years ago. "My heart was in my mouth, and I felt sick. I was upset, and I just didn’t know how to tell him. But when I started writing … that song actually developed into something empowering." He wrote a song about coming out to his father, called 'Out To Sea', but the track did not make it onto his upcoming album. But there are other songs on the offering that will inspire his fans - both gay and straight. "...the message behind this album is to embrace how you feel and who you are and who you love and to feel empowered by it. And you don’t have to change who you are, and, in fact, you should embrace who you are and love who you are." Calum is also gearing up for the release of a new music video with Leona Lewis. The pair teamed up for the duet version of his hit single, 'You Are The Reason'. 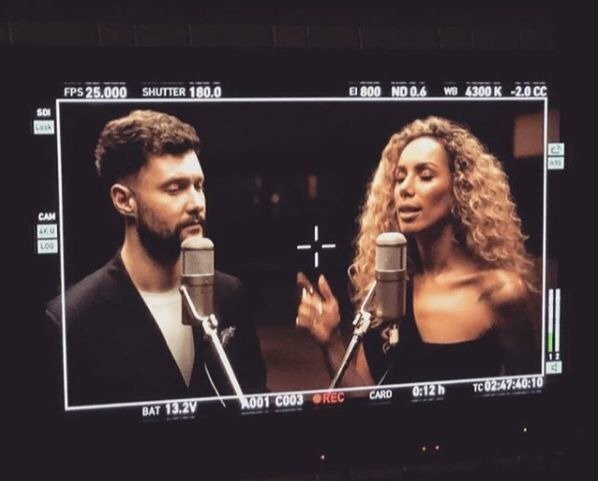 "Filmed something very special with my girl @leonalewis yesterday - coming very soon! Miss you already," he wrote on Sunday.